We'll fly around in circles, waiting for the life that feels like an inside, but is in reality the furthest outside you could get. As the heart drops and chills surge throughout the extremities, we wonder when we'll crash and the oxygen masks will begin a successful operation. Tightened seatbelts leave red claw marks at a peculiar angle on the shoulders of those who are more and less afraid than some. A dive towards that inevitable fate begins. Could these be the final moments for those of us without a hope for the leftover parachute? Life as a fish would be both whimsical and highly peculiar to most who have never experienced it. My homely rainbow pebbles and Wal-Mart purchased castles stand quaint next to the sheer extravagance of the ocean. I may never know life outside of this cage. But I don't mind; it has never just been a cage to me. 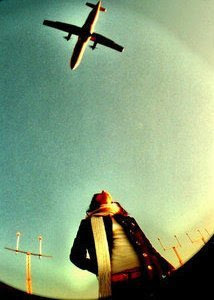 It is my own way of living, a veltanshaung of seeing and experiencing everything around me with heightened sensitivity. I can see people on the outside, floating around without much understanding of how lucky they really are. And then I can relish in the moments when it is just me, alone with my castles and nearly fantastic games of playing hide-and-seek with a reflection in the glass. I couldn't deny the eternal bond that I share with inconveniently-timed pain. For those that have encouraged in the previous days, I applaude your undying faith in somebody that you have never laid eyes on. And thus far, there seems to be a light of sorts beginning to dawn on this shattered life once called my own.